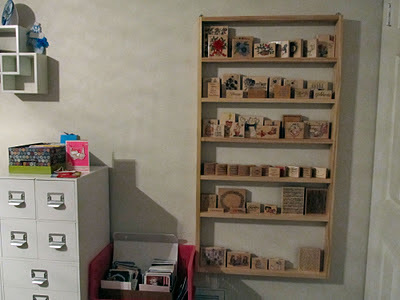 I was very intrigued by the Craft Room tour over at Jill Foster's blog and though maybe not unique, I wanted to share with you what my wonderful husband made for me. In the picture above, you see four small paint cans zip tied to a towel bar. I am at the starting line with Copic markers, but I thought this was a great way to separate them by color families and keep them right above my work surface. As I add markers, it will be easy to attach another towel bar with cans just above this one. This wooden shelf is made of 1/2" x 2" boards and gave me lots of space for my rubber stamps. (as you can see I have filled this one up, so I am hoping to sweet talk him into another one). This is attached to the wall behind the door, so when the door is open, you don't even see it. Thanks for peeking and I hope you are inspired to organize the favorite room in your home! 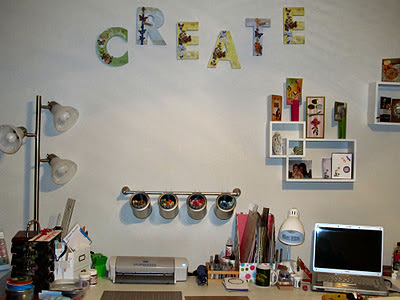 Very creative storage, gotta love your handy hubby for that. Wow, THE Jill Foster commented above, that is so cool in itself! Fabulous organization thanks for sharing.